October is one our favorite months of the year! The leaf colors are changing, there is brisk morning air, warm afternoons, and everything starts to slow down. October brings with it the anticipation and worry of the first frost. We are ready for life to slow down, but not ready to be done with all the fresh produce. But we have lots of produce canned and ready for winter. So if you are going to can produce to eat this winter, you had better hurry. It is too late to can green beans, but is a great time to can tomatoes, peppers, plums, make sauerkraut and blanch and freeze broccoli. The beans have been thrashed. Most of the produce is still producing, although, the plants are looking tired and have slowed. But not the plum trees! 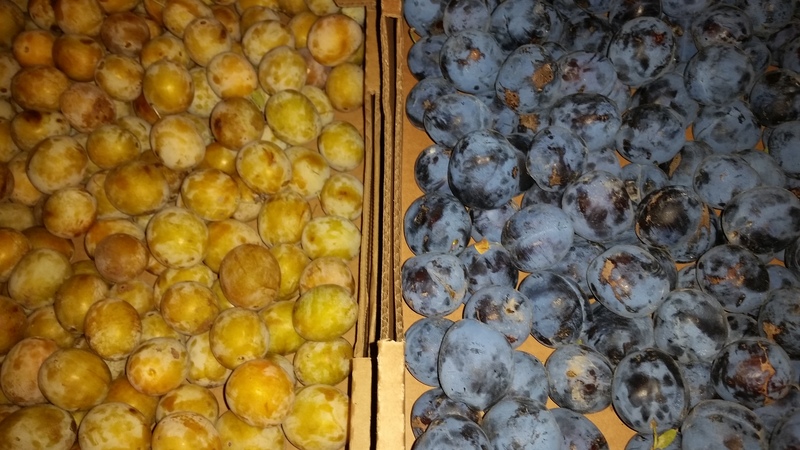 The plums are ready to be picked and are abundant. The house smells like sweet, juicy sugar plums dancing in the air from all the canning, drying, jamming and juicing of the plums. This coming week brings the rush to get the “Experiment Sweet Potatoes Project” out of the ground before that first frost. Sweet potatoes don’t handle frost at all. If the vine is frosted, it goes straight down to the tuber or potato and ruins them. So one last push before we can really slow down for the season. We dug a few plants this week and if what we dug is any indicator of what is out there. Then it may be a good harvest. More on sweet potatoes next week!